Showing 16 articles from October 11, 2014. South Bend Timberland Library presents Friends of the Library Community Potluck, 5-6 p.m., October 15 for all ages. Does the Veterans Administration provide any special funeral services or benefits to old veterans? My father is a 90-year-old World War II veteran with late stage Alzheimer's, so I'm looking into funeral options and would like to know what the VA may provide. Beep beep beep beep - the alarm jolted me awake at 5:30 AM. I flopped out of the hostel bunk bed, careful not to hit my head on the bed just two feet above me, yawning and stretching and remembering the day full of adventure that awaited me. I was headed to the beautiful island of Culebra just off Puerto Rico, and to get there I had to make a long journey on a ferry. Lewis County Deputy Prosecutors have endorsed Mark McClain for Pacific County Prosecutor. Ayers Displays "Prudent Budget Management Expertise"
Ayers' "Work Ethic is Beyond Reproach"
As ballots begin to arrive I wanted to make sure to remind everyone that the Chiefs of Police for Long Beach, South Bend, Shoalwater Bay, and Raymond are asking you to vote for Mark McClain. That portion of Pacific County's budget designated as "Public Safety" represents slightly more than 67 percent of the county's total expenditures. Public safety includes law enforcement (as in Sheriff's Office), courts (North and South District and Superior Court), public defender, juvenile detention, county clerk, civil service, and importantly the prosecutor's office. Integrity is critically important at all levels of governance, but particularly in the public safety arena. Reader Insists, "Colburn has his Facts Mixed Up"
Kevin Colburn's "rebuttal" to my previous week's Letter To The Editor was as much an ad hominem attack on me as presenting any otherwise factual material. I trust you will give me this opportunity to respond. As Democrats, we are united in our support of strong schools and opportunity for EVERY Washington child. 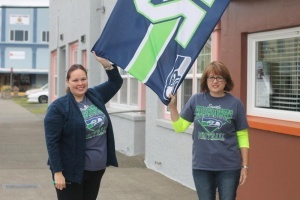 Show your support for local cancer patients by participating in the Willapa Harbor Helping Hands 5k Run/Walk. 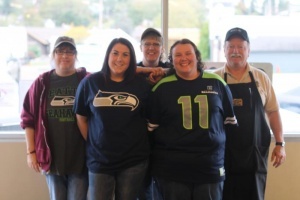 From left are Pioneer Grocery Seahawk's fans Brendi Hanson, Jessica Anderson, Tia Johnson, Dianna Bolling, and Ray Johnson. Allison Mcvey, left, and s Debbie Wilson, of Farmer's Insurance. 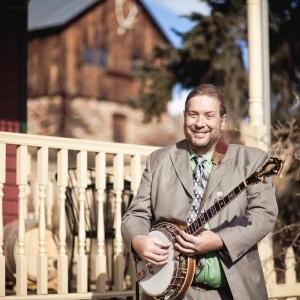 Sunday Afternoon Live (SAL) brings "bluegrass with attitude" to the Willapa community on Sunday, October 26 at 2 p.m. at the Raymond Theatre.